Maya Harris, an LA-based actor who hails from the Bay Area, is a beautiful person inside and out. She has incredible personal style and an affinity for bold lipstick. Today, she shares the drugstore mascara she loves, the best $20 bottle of wine money can buy and the simple daily ritual she does first thing in the morning. The "it girls" we have seen for decades representing Neutrogena are telling no lies! I I have been using Neutrogena since I was 13 years old. My 80-year-old Nana has skin you wouldn't believe and she credits it to Neutrogena! I truly think using a soft towel or loofa with a smidge of the goods twice a day is the trick. I also use an anti aging cream, (never too early) at night and a moisturizer with SPF during the day. Garnier has an excellent brightening and toning cream I swear by. And surprise, surprise, drinking a lot of water and eating your vegetables helps. Still something I have to remind myself, but it shows! What makeup do you usually wear? It may be so 2005, but I use Mac cosmetics. For the coverage I prefer, it does the job. They have really advanced their products to make them feel lighter! Plus, they have truly everything you need, from a specific eye liner sharpener to a ruby red lipstick. How do you switch up your look for a night out? I am a big fan of a bold lip these days, from the Barbie pinks to the deep purples that are almost blue. I think good skin, highlighted and contoured, with a strong brow and wispy lashes paired with a bold lip is the perfect way to give yourself a pop for the night. Forget the eyeliner and eye shadow, bring the attention down to the lips! What haircare products do you love? Tea tree anything! Trader Joes has is a lovely shampoo and conditioner that leaves my locks very clean. I think a deep clean is important, especially for ladies who use a lot of products during the day to do their hair. It also smells great. I have dry hair, so a dab of coconut oil helps me keep it shiny and glowing! Falsies Mascara by Maybelline. I swear by it! I always use it until there is nothing left to put on my lashes. If you like them bold, this is a winner! I would describe my style as a 90s New Yorker with a touch of color. Doing the most this Sunday. For Love & Lemons and LF when my wallet is feeling heavy. Tobi is a great online store for comparable trends to the expensive finds for a price that won't break your bank. Where do you go for a great workout? SoulCycle!! Orangetheory Fitness. Carrie's Pilates Plus. I look to women from previous decades for inspiration. I am really into looks from the 70s and the 90s currently. Juice Crafters for a yummy juice or smoothie post sweat sesh. Favorite wine, Butter Chardonnay from Whole Foods — this is a winner, always! Before I even open my email, social media, or anything that pulls me from myself, I say three things I am grateful for. They can be big or be small, but they are all things that matter to me. This makes me feel thankful and excited for whatever blessing may be coming my way! When I am with close friends. The jokes and the love are both flowing! I just feel like my best self. Be sure to follow Maya on Instagram and check back next week for the latest installment of 52 Faces, a weekly series that spotlights a real woman's beauty routine. 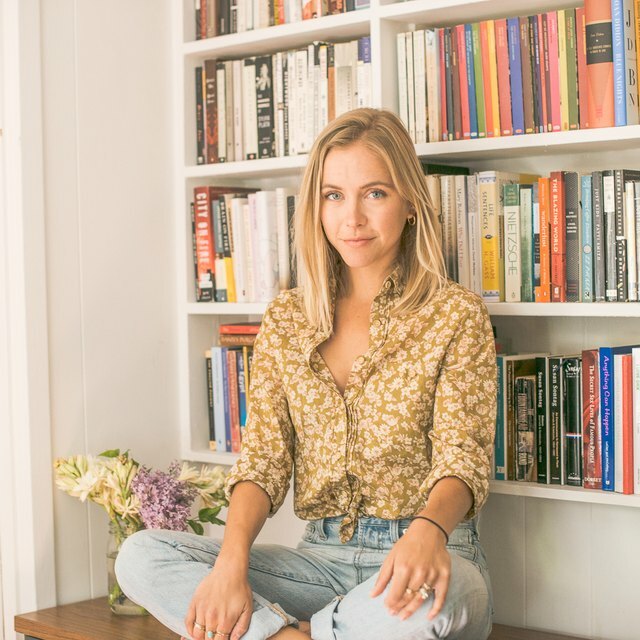 Last week, romance novelist and food blogger Rachel Burke shared the daily ritual that keeps her grounded and the homemade beauty remedy she swears by.